The sixteenth century altarpiece depicting a Crucifixion with St. John the Baptist and St. Alexander has been removed from the Cupola Gallery for an important restoration. The restoration will take about four months. The cleaning is revealing a bright range of original colors hidden up until now by patina and darkening. Before returning to its place, it will be displayed in the exhibit “Renaissance of the Ticino area: from the territory to the museum” curated by Giovanni Agosti and Jacoo Stoppa at the Züst Art Gallery in Switzerland. The restoration and the exhibit will be an opportunity to analyze and study the object. 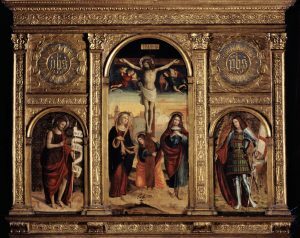 Notwithstanding previous studies, much still remains to understand about it, starting with the name of the artist and the very organization of the altarpiece, which today is set in a nineteenth century frame.